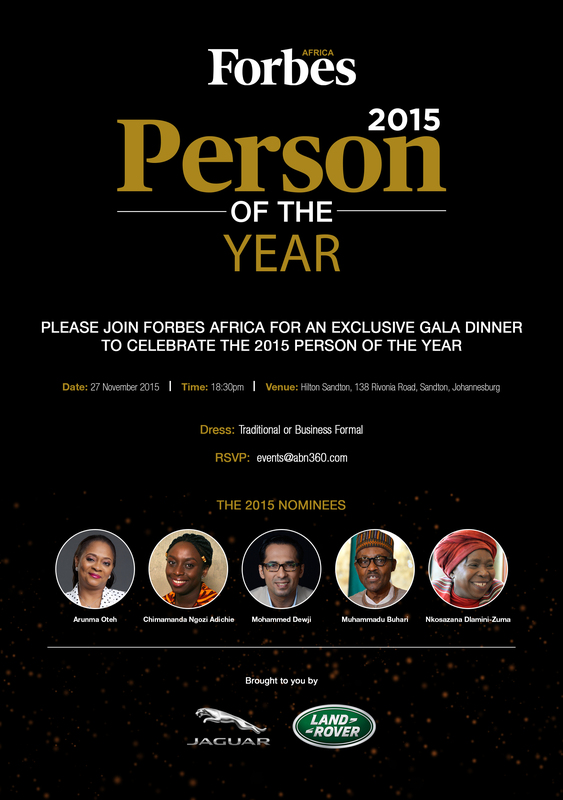 On Friday, the 27th of November, 2015 Forbes Africa and the ABN Group hosted the 5th Annual Forbes Africa Person of the Year award dinner. The award has moved from Lagos to Nairobi and now finally made its way to Johannesburg South Africa. 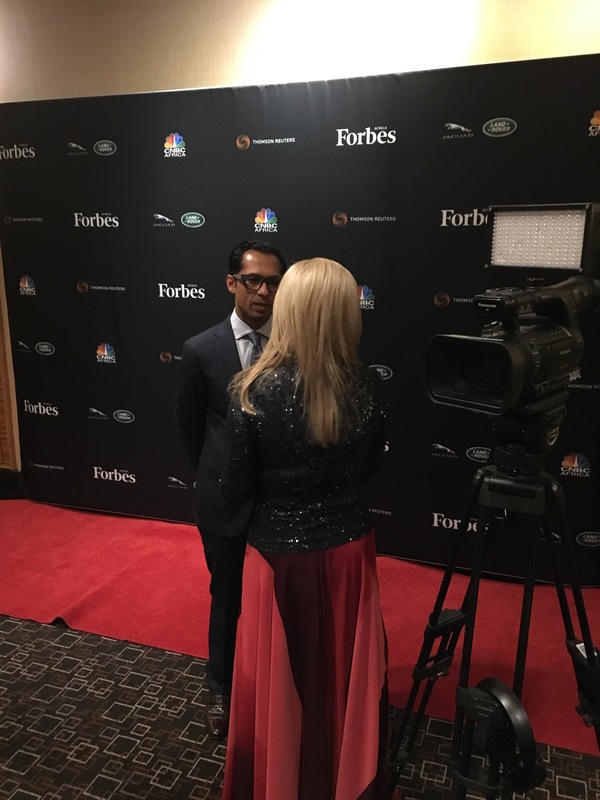 The award was won by Mohammed Dewji, CEO of the MeTL Group, Tanzania. Earlier this year, Akinwumi Adesina was appointed the President of the African Development Bank this year – in 2013, he was elected Forbes Person of the Year. Mohammed joins Dr. Adesina, Sanusi Lamido Sanusi, James Mwangi, and Aliko Dangote as part of the Person of the year Alumnii. An honour that is globally second to none. The award is more than than the individual. In a very real way, is about Africa’s place on the centre stage of global economics and innovation. I just attended the Global CEO forum in the Manila and I was so proud to see that the optimism that we all share about the African story is now being recognized as a reality of every self-respecting business family in the world. What we also witnessed in the discussions was the disruption being caused by innovation in almost everything we do. My generation does not accept the status quo that “we should do things because that’s how things are done”. We want to turn everything on its head – sometimes to our own peril and detriment. Innovation is almost never clean and linear. Much like running businesses in the African continent, it is messy and involves lateral thinking. When connecting the dots in retrospect, we may realize how different things turned out from the initial idea, after countless permutations and transformations. An entrepreneur must be prepared to change; to adapt; to evolve; to push through boom and bust cycles with an eye towards the horizon; to understand that what drives growth today will be different from what drives growth tomorrow. The underlying driver is the belief of one’s vision and the ability to work relentlessly. Forbes Africa encompasses and recognizes these values. In a recent interview, Mark Mobius made this observation: “the headlines are usually very bad about Africa. But if you go on the ground, if you look carefully at what is happening, you will find out in fact that there is a lot of opportunity, tremendous opportunity.” In every issue of Forbes Africa, we give voice to entrepreneurs, trailblazers, and innovators who were able to capitalize on these opportunities. We hope that investors looking to mine superior returns will find, through our magazine, evidence of commercial possibility in Africa. The first issue of Forbes Africa lined newsstands in October 2011, when digital platforms were already beginning to challenge the supremacy of print media. But we forayed into this fiercely competitive arena because we felt the lack of an outlet that captured the stories of those who have brought about tectonic shifts in the business and economic landscape of Africa. If you look at the picture of Patrice Motsepe on the cover of Forbes Africa from October 2011, you’ll notice the air of confidence about him, confidence which comes only with a great deal of experience. In that issue, we related Motsepe’s inspiring story: from the six-year-old helping his father behind the counter to the sharp lawyer who had the crazy idea to take over and turn around some loss-making, low-producing marginal mines. It is through such stories that Forbes Africa kindles in young Africans the kind of risk-taking mentality and can-do attitude it takes to be successful. The magazine under Chris Bishop has grown from strength to strength, with every new issue setting a new benchmark for editorial excellence. In an industry like ours, where changing media consumption habits and increased competition move the goal post on a daily basis, our team has done extremely well in not just remaining relevant, but continuing to grow our spheres of influence. While speaking at a conference on digital media in Nairobi last month where somebody pointed out that the audience, and not content is king. While that might be the case in some markets, in Africa, distribution is king kong. Distribution of a pan African magazine presents numerous logistical challenges – so being recognized by IPSOS as the most widely read monthly magazine among Africa’s affluent is testament to our success in this regard. 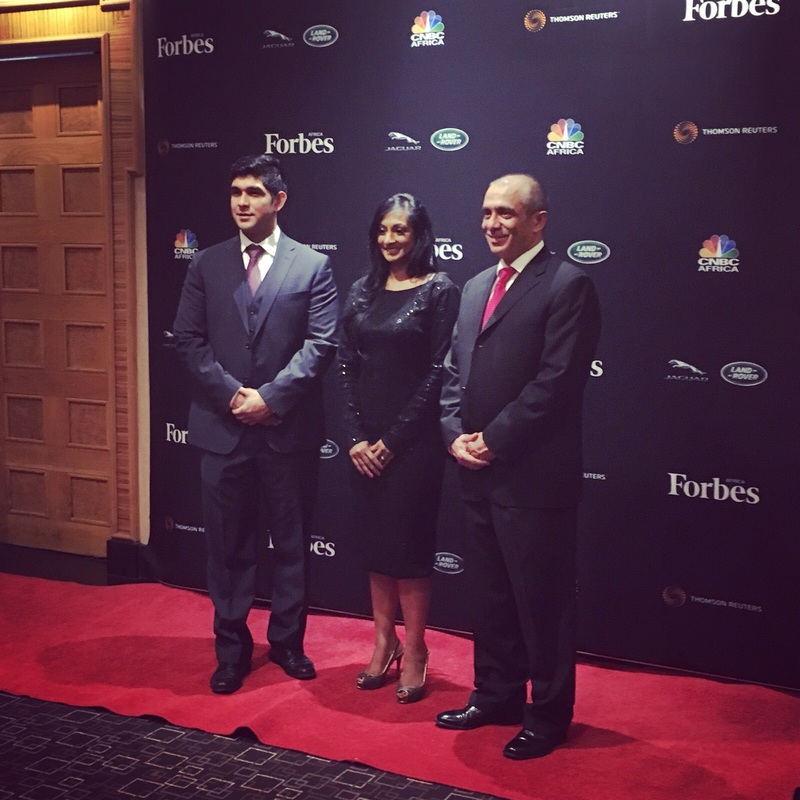 Chris Bishop and I attended at the first ever Forbes partner conference in New Jersey last month. 32 out of 37 local language and regional editions were present to discuss a number of challenges, from magazine layouts to dealing with native content and advertising strategies. When we launched, we were the 16th licensee. Today, with 37 partners across the globe, the Forbes brand has, in 4 short years, become not just the most powerful business media brand in Africa, but also in the world. I’d like to take this opportunity to highlight a few other notable accomplishments of the team. Jay Caboz, a journalist on the Forbes Africa team has won three awards for the magazine this year, winning two awards just earlier this month at the ZIMEO “Excellence in Media” Awards Dinner on the back of the African Media Leaders Forum. Our latest count shows that 14 of 29 dollar Billionaires in Sub Saharan Africa have graced the covers of Forbes Africa. Wendy Applebaum was the first woman to grace the covers of both Forbes Africa and Forbes Woman. Earlier this year we launched our first ever 30 under 30 list – our most popular issue till date. Next year we will build on this franchise by incorporating an event focused at issues around youth, unemployment and entrepreneurism. Finally, The South African Advertising and Research Foundation, who run the All Media Product Survey once every quarter released their latest survey in Q3. The most recent tally puts Forbes Africa ahead of all its competitors in the business genre, with the magazines average issue readership sitting at 197,000. The event was attended by 150 African Chief Executives, Government dignitaries and members of the financial services community.